I am the proud owner of two pairs of sealskin moccasins or slippers as well as other sealskin products. 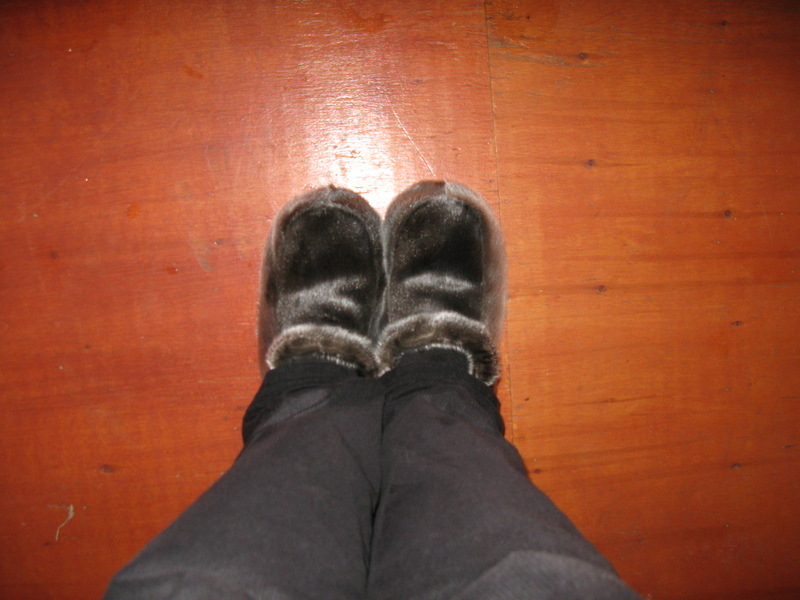 Some people have seen me wearing the slippers at the Confederation Building over the past number of weeks. Santa did bring me a pair. If you would like to get your own pair, GNP Craft Producers in Shoal Cove East on the Great Northern Peninsula can take your order over the telephone and ship your product. Visit their site at http://www.gnpcraft.com. Their prices range from $115-130 a pair depending on size. They also have children’s sizes and a variety of other products. All items are locally made, by local people. This social enterprise continues to train and pass on the long-lived traditional skills of making sealskin clothing and boots. They have their own tannery, workshop and storefront. Support local business, local traditions – let’s create larger local demand for sealskin products! Posted on January 29, 2012, in Heritage, Tradition and tagged Clothing, Confederation Building, Great Northern Peninsula, Moccasin, Santa, Santa Claus, seal, seal hunt, sealskin, Shopping, www.gnpcraft.com. Bookmark the permalink. 4 Comments. I definitely want a pair! As soon as I pay off my credit card bill from Christmas…! What are they like on the inside? Is there a fuzzy lining of any sort, or are they straight tanned leather? They have a fuzzy lining. Very comfortable. You could also get traditional bark tanned leather; however, the pair I had when I was younger also had a lining.